After eating the French Toast Bake and ham yesterday for brunch, no one was really ready for a big Easter dinner so we made it tonight instead. We had ham, the mashed potatoes that I put on top of the Shepherd’s Pie (recipe on blog already), this Corn and Zucchini Melody and Ham and Parmesan Rolls (recipe to follow) and later we are going to have Bunny Puffs for dessert (recipe also to follow). This recipe comes from allrecipes.com and it is so good (of course anything cooked in bacon drippings is bound to be good!). 1 Place bacon in a large, deep skillet. Cook over medium high heat until evenly brown. Reserve 1 tablespoon of drippings. Drain bacon, chop and set aside. 2 Heat the bacon drippings in the skillet over medium heat. Saute the zucchini, corn and onion until tender but still crisp, about 10 minutes. Season with pepper. 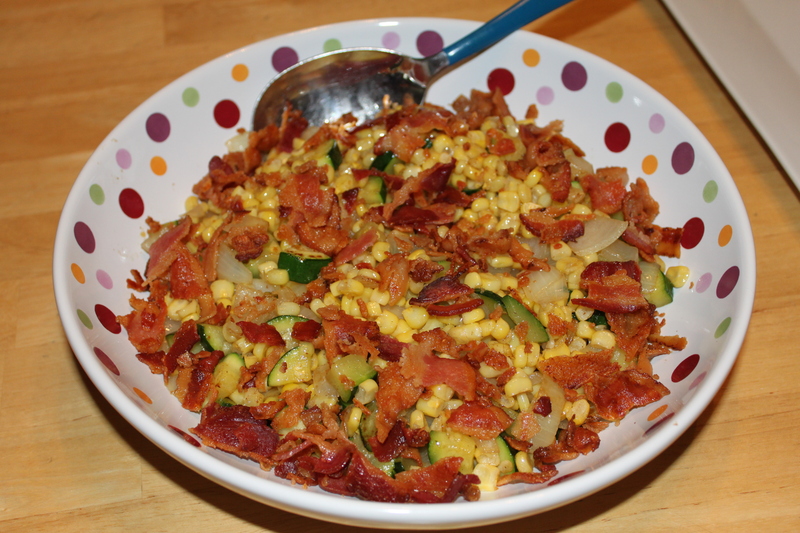 Spoon vegetables in bowl and sprinkle with chopped bacon and shredded cheese.